AURORA, Ill. – Five days remain until the world’s top supercross and motocross riders take to the stage for the second-annual Monster Energy Cup at Las Vegas’ Sam Boyd Stadium this Saturday night. Led by defending Monster Energy Cup Champion Ryan Villopoto, this year’s line-up includes 2010 Supercross Class Champion Ryan Dungey, two-time Supercross Class Champion Chad Reed, supercross veteran Kevin Windham, defending Lites Class Champions Justin Barcia and Eli Tomac and 250cc AMA Motocross champion Blake Baggett. "It's going to be tough to repeat this year," said Villopoto. "Last year we had a perfect night and came away with the million, but this year it sounds like all the top guys are going for it. With the three race format, consistency will be the key." "They've made some changes to the track this year," added Villopoto. "It's always exciting to race a track that's a little different from your typical supercross track. The joker lane should be interesting and some strategy will definitely come into play." At the inaugural Monster Energy Cup, Villopoto swept all three races. He earned the holeshot in the first two races, and in the third and final race, he passed holeshot winner Mike Alessi on the opening lap and rode to the $1 million victory. The Monster Energy Cup Championship rounded out a perfect season for Villopoto having won the 450cc AMA Motocross and Supercross Class championships as well as the Motocross des Nations. Last year’s runner-up, Ryan Dungey, made his debut at the Monster Energy Cup aboard his Red Bull KTM motorcycle, finishing 3-2-2. Dungey recently captured his second 450cc AMA Motocross Championship. Reed, who will make his Monster Energy Cup debut, has not raced since suffering a major crash at the Cowboys Stadium stop during this year’s Monster Energy Supercross Championship. In the crash he fractured his T-6, two ribs, tibia, fibula, torn ACL, LCL, and meniscus. One of the most anticipated Open Class debuts is that of Justin Barcia, who is a two-time defending Lites Class Champion. The Monster Energy Cup will be the first time the Muscle Milk Honda rider will compete inside a stadium on a 450cc motorcycle. The Monster Energy Cup will be broadcast to 124 countries around the globe and live domestically on SPEED Saturday, October 20 at 7:00 p.m. PST. SPEED will provide the broadcast to an additional 45 countries and territories outside of the U.S., including Canada and South America. ESPN International will broadcast the race live – for the first time ever – to 78 countries in Australia, the Middle East and Africa. Check local listings for exact time and channel. The 2012 Monster Energy Cup features an all-new track design inspired by five-time Supercross Class Champion Ricky Carmichael. The Carmichael-inspired track design will consist of supercross and motocross obstacles unlike any other racetrack design in the world. New to this year’s track will be a 200’ banked sweeping turn that will be built in the stands, two 11 rider starting gates split by 220’ before they converge at the apex of the 300’ start straight and the joker lane that riders will have to race through at least once during laps 2-10. After racing through these sections of the track, fans will be treated to equally exciting racing lanes that are built into the Monster Energy Fan Zone, which is located outside of the stadium. The Monster Energy Cup posts a $250,000 purse with the winner walking away with a $100,000 check, and any rider that wins all three Main Events will take home $1 million. For more information on the Monster Energy Cup, log on to www.MonsterEnergyCup.com. For all media requests, please contact Denny Hartwig dhartwig@feldinc.com or 630-566-6305. 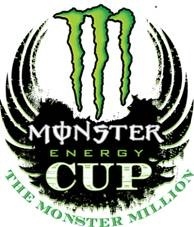 To follow the Monster Energy Cup on Facebook and Twitter, log on to www.Facebook.com/VegasMECup and www.Twitter.com/VegasMECup. AURORA, Ill. – Feld Motor Sports® announced today that the pre-race press conference and the qualifying sessions for the second-annual Monster Energy Cup at Las Vegas’ Sam Boyd Stadium will be streamed live for free at www.MonsterEnergyCup.com/SupercrossLive and www.Facebook.com/VegasMECup. The Monster Energy Cup pre-race press conference, featuring the 2011 winner of the Monster Million, Ryan Villopoto, in addition to Ryan Dungey, Chad Reed, Justin Barcia, Justin Brayton and Adam Cianciarulo, will stream live this Friday at 6:00 p.m. PST. The afternoon qualifying sessions on race day will also be streamed live on Saturday from 1:30 – 4:15 p.m. PST. Supercross LIVE’s Jim Holley, a former World Supercross Champion, and Kevin Barnett, Olympian and professional broadcaster, will provide commentary during Saturday’s qualifying sessions. Fans can continue to access special Supercross LIVE video content throughout the weekend including track walk interviews with the riders, behind the scenes, and podium interviews at the end of the evening. They will be made available on the website and social media. SPEED and ESPN International will broadcast the Monster Energy Cup live (in the U.S., Australia, Africa, and Middle East), beginning Saturday at 7:00 p.m. PST., and SPEED2 will stream the main event live at www.SPEED2.com. The 2012 Monster Energy Cup features an all-new track design inspired by five-time Supercross Class Champion Ricky Carmichael. The Carmichael-inspired track design will consist of supercross and motocross obstacles unlike any other racetrack design in the world. New to this year’s track will be a 200’ banked sweeping turn that will be built in the stands, two 11 rider starting gates split by 220’ before they converge at the apex of the 300’ start straight and the joker lane that riders will have to race through at least once during laps 2-10. After racing through these sections of the track, fans will be treated to equally exciting racing lane that are built into the Monster Energy Fan Zone, which is located outside of the stadium. The Monster Energy Cup posts a $250,000 purse with the winner walking away with a $100,000 check, and any rider that wins all three Main Events will take home $1 million. AURORA, Ill. – Feld Motor Sports® announced today that the second-annual Monster Energy Cup, from Las Vegas’ Sam Boyd Stadium, will be broadcast to 124 countries around the globe and live domestically on SPEED Saturday, October 20 at 7:00 p.m. PST. For more information on the Monster Energy Cup, log on to www.SupercrossOnline.com. For all media requests, please contact Denny Hartwig dhartwig@feldinc.com or 630-566-6305. To follow the Monster Energy Cup on Facebook and Twitter, log on to www.Facebook.com/VegasMECup and www.Twitter.com/VegasMECup. Feld Motor Sports®, Inc. is the world leader in specialized arena and stadium-based motor sports entertainment. Feld Motor Sports, Inc. productions include Advance Auto Parts Monster Jam®, Monster Energy® Supercross, AMSOIL Arenacross, Monster Energy Cup, Nuclear Cowboyz℠, and IHRA® Nitro Jam®. Feld Motor Sports, Inc. is a division of Feld Entertainment, the world’s largest producer of live family entertainment. For more information on Feld Entertainment, visit www.feldentertainment.com.